Ilya Nikolayevich Ulyanov (Russian: Илья́ Никола́евич Улья́нов; 31 July [O.S. 19 July] 1831—24 January [O.S. 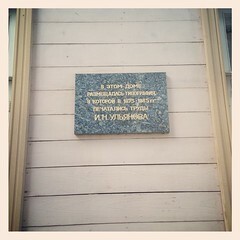 12 January] 1886, Simbirsk) was a Russian public figure in the field of public education. He was the father of revolutionaries Vladimir Lenin, who became a Bolshevik leader and founder of the Soviet Union, and Aleksandr Ulyanov, who was executed for his attempt to assassinate Tsar Alexander III in 1887.